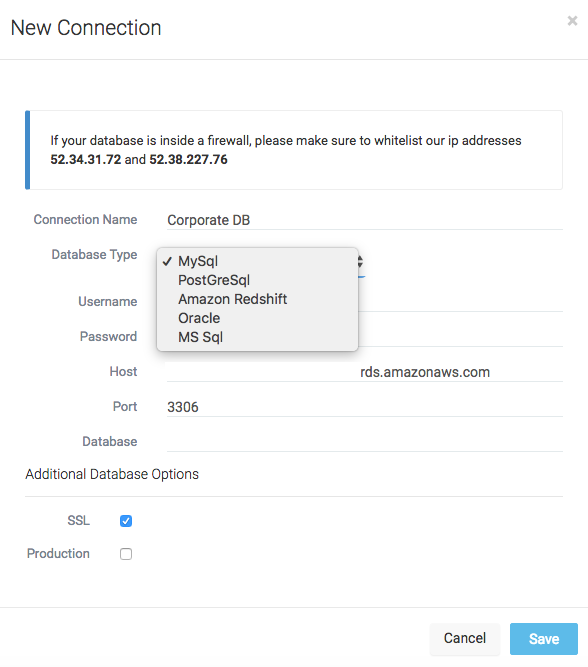 Kloudio lets you connect your database in the Kloudio portal so that you can then use it to extract data to spreadsheets and/or write data back to the database. What is a database connection? The specification of your database that is needed by Kloudio in order to connect to it for extracting and updating data on your behalf to and from your spreadsheets. Why do I need to create a database connection in Kloudio? Kloudio needs a valid database connection in order to connect to your database, on your behalf, in a secure and authenticated manner to extract data into your Google Sheets. This step is a pre-requisite for you to download data onto Google Sheets or write data back to the database from Google Sheets using Kloudio. If your database is inside a firewall, please whitelist our IP addresses: 52.34.31.72 and 52.38.227.76. Depending on your hosting environment, the procedure to whitelist will vary. Please contact info@kloud.io if you have any questions regarding this. After filling all fields, click Save. Kloudio will use these stored credentials to execute your configured Kloudio reports securely and send it to Google Sheets. Congratulations! You have successfully created a connection in Kloudio. You are now ready to create your first report!